Cool Rockets is a company created by Jeff Brewer in the mid-1990’s. After a 3 year stint at Skellington Productions (The Nightmare Before Christmas, James and the Giant Peach), and during slack times at the ILM/Lucasfilm modelshop for the next 8 years, CR’s line of desktop retro/comic rocket sculptures grew from 3 to 11 styles. Each was an original design inspired by vintage designs and comic book art from the 40’s and 50’s, and the line could be found on coolrockets.com, ComicCon San Diego, and a host of other websites and retail outlets. 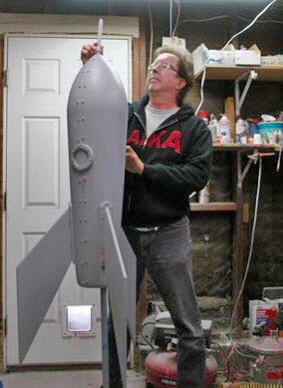 While no longer offering the line of desktop rockets, Cool Rockets now specializes in larger scale custom-built rockets for office lobby art, trade shows, restaurant décor, etc. We also help clients with “2D to 3D” projects; taking a 2D idea (like a pencil sketch of a product idea) to a 3D model or prototype of that idea using 3D modeling and 3D printing, and assisting or managing it’s manufacture. Our operation is small, and our rates reflect that economy of scale.